​is a sanskrit word used to define a physical Yoga posture or position which is designed to enhance the body's functions. Practicing asanas create strength and endurance, improves circulation and energy flow, cleanses organs and other systems, and increases range of motion in the muscles and joints. Asana means "seat" in Sanskrit. This slow-paced class focuses on breath-work, body awareness and alignment. With an emphasis on gentle hip and shoulder openers rather than asana flow, the class is perfect for beginners. 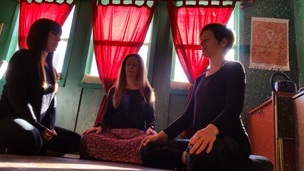 These classes employ Structural Yoga Therapy techniques to strengthen and release, and enables the practitioners to heal and revitalize the body. Instruction focuses on discovering and reversing imbalances to allow students to concentrate energy more efficiently. Students explore new ways to move and breathe to restore strength to the body and joy to life. Students acquire tools to assess and address their own needs. These classes are designed for individuals living with a chronic condition or illness; those with persistent back, knee or shoulder pain, and those who simply want to get to know their body again. Therapeutic yoga is a gentle approach, but that doesn't mean you are not going to work. We will look to build strength and suppleness. The instructor will encourage you to check in with how you are feeling, making sure you are not over working, and that you are feeling the effort in the right place. Everyone works at a different pace. Most of the Therapeutic classes spend some time doing TRE, or tremoring, which is an integral part of this practice. The TRE will begin to unwind tight places in your body, which is important to do before too much change can happen in the muscle tissue. TRE works mainly with the Fascia system. Fascia is the tissue that covers the muscles and organs, but it also winds its way through the muscle and bone tissue, and when it is tight, it is going to affect everything. So we will use the neurogenic tremors of TRE to unwind deep tightness and constriction. Once you begin to do that, you will find the asanas, or yoga poses, will work better faster, and you will be able to relax more deeply than you have before. This class combines flexibility with targeted strengthening yoga movements. Using props, kinesiology and precision, participants will practice bringing increased strength to weak, injured or compromised areas. The use of Structural Yoga techniques combined with the mindful and peaceful aspects inherent to yoga makes this workshop perfect for anyone looking to recover from an injury, regain balance, slow down the effects of aging and bone loss, and increase muscle tone. Usually this class will end with T.R.E to help the body release in final relaxation. SAGE Yoga leads students ages 65 and up to greater range of motion, vitality, and health. Bolsters, chairs, the floor, the wall, and all types of props are used to adapt yoga postures for every body. Students can feel comfortable and safe in a judgement-free environment, knowing that his or her particular bodily needs will be addressed. This class is created and taught by yoga teacher and retired nurse Connie Hull. Enjoy happy, healthy, and wise aging! re-establish balance in the body and revitalize the mind. During restorative yoga sessions, students are guided in the use of special breathing techniques to achieve active relaxation. By helping to bring the body’s organs and systems back to balance, restorative yoga can also stimulate healing from illness or injury. Those who have a very vigorous practice often employ restorative yoga to reestablish balance. Quite simply, it makes you feel wonderful! Restorative yoga sessions will sometimes conclude with Yoga Nidra or “yogic sleep.” Practitioners of Yoga Nidra seek to achieve deep relaxation while remaining completely alert. During Yoga Nidra you lie on your back, relax and follow instructions that take you on a guided journey into complete relaxation – physically, mentally and emotionally. and some asana experience who seek a more active and engaging session. Designed for experienced, regular practitioners who wish to challenge themselves, moderate flow asana classes are intended for students who are comfortable with the basics and want an expanded practice. Classes are typically comprised of students from across the spectrum of experience. The teacher individualizes instruction, providing appropriate modifications for beginners and options for those seeking to challenge themselves. This class is designed for yoga practitioners who have a solid understanding of alignment. It is an active class in which students are challenged to achieve a harmonious flow as they move through the poses. Instruction includes more advanced asana variations, including arm balances, standing balances and inversions. Because the class attracts practitioners at various stages of accomplishment, students attempting more challenging poses will receive individual attention as needed. These classes offer newcomers to yoga an intimate, comfortable setting in which to learn about this ancient practice. Students are taught basic yoga poses and philosophy in a workshop format that encourages questions. Enrollment each session is intentionally kept to a minimum and classes are comprised exclusively of novices, enabling elemental instruction tailored to each student’s body type, strengths and weaknesses. The class is intended to prepare students to comfortably enter any gentle (no-flow) or basic asana flow class. Class sessions run from 5 to 8 weeks and are scheduled throughout the year. Pre-registration is required. Best suited for people with previous yoga experience, alignment classes aim to enhance practitioners’ experience of specific asana poses – those chosen by the students themselves. As such, the class is structured as a workshop rather than a flow class and questions are encouraged. Students warm up with a series of sun salutes before moving to concentrate on individual poses. The aim of the class is for students to become sufficiently intimate and comfortable with their bodies to recognize the best expression of each asana pose for themselves as individuals. Pre-registration is required. TRE® utilizes an innovative set of exercises to relieve stress, tension and trauma trapped in the body’s deeply embedded muscle memory. Trained and certified by Dr. David Berceli, Bonnie safely guides students through specific shaking/tremoring movements that discharge tension, calm the nervous system and rebalance the body. Many people report enhanced feelings of peace and well-being after a single TRE® session. TRE® is based on the well-documented finding that stress and tension are physiological as well as psychological. Persistent, targeted tremoring has been shown to naturally reduce stress, increase the resiliency of the body, and enable us to better handle new stressors. From mild upset to severe anxiety, TRE® reduces distress that stems from work stress, excessive worry, relationship conflicts, physical stresses or accident trauma. TRE® is a self-regulating process: individuals who suddenly find the tremoring uncomfortable can simply straighten their legs or roll to the side to stop it. A singular benefit of this approach is that it often works without requiring the person to remember, relive, or even recognize the source event. TRE® is also a great way to enter meditation. People who struggle with sitting still and keeping the mind quiet, if you try TRE first, you will find it easier to sit for meditation.